Me: But how do you completely separate the two? It’s pretty hard to have gluten without any residue of the starch, right? Of course he must have said something back to me, he was too kind and good a practitioner not to, but what I remember is the initial silence of hesitation, which I took to mean I had hit some kind of important nail on the head. The reason, even so many years later, that I eat gluten free and have designated my blog gluten free is not because I am celiac, or even gluten intolerant. It’s because of the starches that inevitably go with and cling to the gluten in wheat and rye. And unlike some people who tend to think that ” a little won’t hurt” I tend to stay on the side of being sure to go way out of my way to avoid that other proverbial time bomb, “the slippery slope.” It may be overkill, but in general, it’s worked quite well for me. It would take something like the fine print in this FODMAPS PDF to arrive on the scene so many years later to explain why I also have always had trouble rotating wheat and rye back in, as the naturaopath had hoped I’d be able to do. And why I also had trouble in subsequent years digesting barley, and why I had to give up my once-beloved coffee substitute, Teeccino. Instead I went to straight chicory, thinking that would keep me safe from the gluten I might have somehow mysteriously developed a problem with. Or so I assumed. But it would take a FODMAPS list from Stanford, years later, to help me consider why eventually I also tossed out the chicory itself. It and wheat, rye and barley all have similar sugars in them that cause the kind of digestive cacaphony I had been so persistently trying to avoid. So much has been learned since I was diagnosed with what the doctor then called “spastic colon” back in 1976. The way he explained it to me then was that while some people get headaches, I get digestive troubles in response to stress. He had me on an involuntary muscle relaxer, and I was to eat things like cottage cheese and hamburgers without condiments, chewing deliberately and slowly, and making sure not to eat with my family, who watched TV and yelled at it and each other more often than not. Although stress certainly is a factor, there’s still way more to learn about what causes these problems. But one thing that caught my eye on the FODMAP list was that spelt, although it is not gluten free, possesses a differently structured chemistry and physiology that does not contain the sugars that would make it a high FODMAP risk. So, according to some sources anyway, on its own, in bread or baked goods not combined with these other flours, it is considered inulin free and low FODMAP. Something I’ve always enjoyed and longed to do as much as my drawing and painting is baking bread. In my teen years and early 20’s, I prided myself on expert pie crust learned from my grandmother. Her brothers ran a bakery, and I still own a pastry cloth passed down from them. 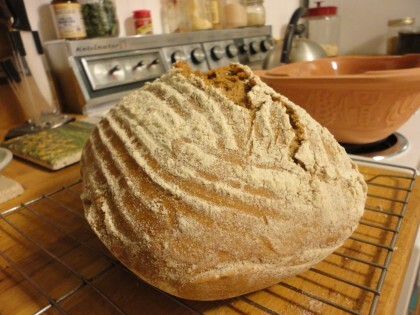 But my ultimate baking joy was homemade bread, which my sister still remembers loving to eat. I reveled in the process of kneading and letting the dough rise. I daydreamed about working in a bakery. In fact while I was in college I remember standing in front of one and trying to talk myself into what it would be like to go in there and ask for a job, quit my classes and get up at 4 in the morning to go in and bake. I never made it up to the counter. Instead I followed my parents’ wishes for me to finish college. Such daydreams have been deferred to later in life, but I find with delightful surprise, they are no less dear, and the feel of bread made by my own hands is even more satisfying than I remember, like shaking hands with a long lost friend. Being a former bread maker, I have often surfed through articles and mentions about how sourdough bread is more easily digestible than other kinds of wheat bread, and purportedly even some with celiac disease can eat it because of how the fermentation process alters the structure of the gluten. I thought back to a very hard time in my life when things were so tough for me I could hardly eat at all My adrenaline was on high alert too much of the time. But I always could have a very plain sandwich or toast made from sourdough bread. And of course, being Italian, it was often a preferred choice of my Dad’s. Sourdough and I were old friends. But should we try getting reacquainted, and if so, how? I’m certainly game to perform what I wryly (and inaccurately) call “science experiments” on myself. In fact I prefer this to having someone else give me a list of foods to eat or not eat. I like the guidelines, of course, and they are necessary, but the true test is how my body feels when I do or don’t eat something. So I thought of buying some sourdough bread off the shelf. In fact I did, after standing there for 10 minutes and doing some rudimentary lymph testing on myself and it over and over. But in the end, I gave it to a friend without opening the seal. I decided to play it safe and start from scratch all the way down to a starter I made with pure spelt. After six years of no wheat and many more years of no wheat prior to that one year of experimentation with it, this would be the best way to know if spelt would work for me. There would be no question about whether it was the wheat or the spelt. Now the real question is how did I feel after eating this bread? The shock of my life is this: I felt BETTER. I kept waiting for the lump in my stomach, trouble in my colon and the weak-in-my-legs feeling that has always accompanied the eating of most all wheat bread, but it never came. Not only did it not arrive, I was most certainly absorbing the touted nutrients like more B vitamins, higher protein, l-triptophan, and more I read about in this PDF. The water soluble nature of the fat in spelt was making it easy for my digestive system to make use of all these nutritional perks. I had more energy. I felt full without bloating. My legs felt stronger, not weaker. So I didn’t stop at the bread. Buoyed on by my own sense of adventure and how absolutely good I felt, I tried my hand at this no oil sourdough pizza dough recipe and converted it to spelt. The first time I was wary, and added some gluten free flours. It came out rather flat and stiff, but alas, from trying to follow the directions to bake the whole thing on a sheet of baking parchment, it hit the floor somewhere between the oven and the counter I was aiming for. I scooped off the toppings and ate them with rice. I went back to the drawing board in my mind and made some intrepid innovations in kneading and baking techniques. I heated up my Calphalon fryer in the oven and used it like a deep dish pizza stone. The result was the best pizza dough I can remember ever tasting. Here’s the picture I snapped as the battery in my camera was going dead, but you get the idea. The nice thing about these breads is that I do not feel compelled to overeat them, which, to me, is a sign of the absence of food intolerance. Since I can tolerate the spelt, my body seems to know when it’s had just enough. That’s a minor miracle of its own. A sandwich has to have something to go in it. So I wanted to share a filling that can be converted nicely into a spread. It’s a soy free version of the filling in Susan’s Spaghetti Squash Pesto Lasagna. This was such a delightfully tasty surprise the first time I subbed it in to go in the lasagna recipe that I knew I could use it as a spread on its own. The sandwich you see at the top of this blog post is a “panini” I stuffed with baby romaine and this spread, flattening it in my non-stick frying pan with an old Le Creuset lid, which works perfectly. This effect can also be achieved with gluten-free bread or corn tortillas, or if you want to avoid all that, toss it with a hot grain and some veggies. Or make the lasagna with it. You won’t be disappointed. I honestly did nothing much but sub out the tofu for the cannellini beans. You may be tempted to tinker, but the simplicity of this (and the fresh basil) is what makes it work. 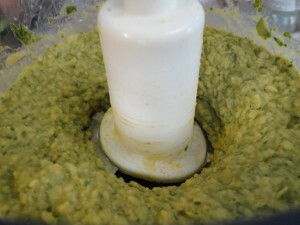 Process the garlic cloves and the basil leaves in the food processor. Add the rest of the ingredients and process until you have a smooth thick spread. If you need a few drops of water or lemon juice to achieve this, use them, but don’t overdo. Use in a sandwich, as a filling in Susan’s delicious lasagna, as a pizza topping, or a dip for your favorite veggies. Or anything else your culinary imagination can dream up. Sandwiches have many fond and loving associations for me. When my son was very small, he’d climb into bed with his Dad and me, and wiggle himself between us. “I want to be the peanut butter” he would say. And, playing the parts of the two pieces of bread, we’d squeeze him tight and he’d giggle with happiness. Our playfulness in acting out this metaphor has always reminded me of the times in my life there’s been nothing more comforting than a good sandwich. Even simple ones can be a meal unto themselves. The one I’ll never forget is the peanut butter sandwich on supermarket whole wheat my cousin Tom made me back in the late 70’s the night he insisted I come over to his apartment and tell him what was going on in my life. After he heard the horror story of the entanglement of my roommate in aiding and abetting an abusive relationship I was trying to get out of, he said, simply, “That’s it. You’re moving in with me.” And he made me a peanut butter sandwich and poured me a glass of white wine to go with it. It’s still the best sandwich anyone else has ever made me, because it came with the love and support I needed but had not been able to reach out for until that night. My cousin Tom’s Dad, also named Tom, was famous in our family for his insistence on making anything he ate into a sandwich. I don’t think I’ll go that far, but I sure am glad I have the option, and that when I feel like it, I can savor the creativity of shaping the dough in my hands again, and foster the mysterious alchemy of the starter and the rise. Because like the song says, everything old is new again. Oh, what a wonderful surprise and enlightenment. A note to my amazing readers: I want to assure those of who need to be completely gluten free that the lion’s share of my recipes will continue to be just that. If I do post an occasional baking recipe using spelt, I’ll also include a gluten free option, too, whenever possible. That’s wonderful, Maria! And very interesting information, too – I didn’t know about the difference between sourdough vs regular and its effects. Coincidentally, I’ve been slowly adding wheat/etc back into my diet, too (I’m not celiac, either; tests just showed a sensitivity to wheat so I had cut it out) – and so far, so good! I also follow the “listen to my body” feedback, using tests and whatnot as just guidelines (and still mostly go gluten-free, but it’s nice to not have that restriction when traveling or whatnot). It’s really the best method. It also seems your body heals itself from earlier damage as you’re eating plant-based, so after time, you can slowly re-introduce items without the negative effects (and then just don’t over-do-it). The brain and body are truly miraculous things with their capacity to change and heal. I will have to try your spelt bread! It looks amazing and so delicious (the pizza, too!!). I found a local gf bakery that makes a delicious gf sourdough bread – closest to the real deal that I’ve found yet, so I will continue to purchase that one, but sprinkle in some homemade, too! Having a sandwich is a nice comfort every now and then. And that spread sounds very tasty! I have a bunch of fresh basil that I need something to make with- perhaps I’ll do this. 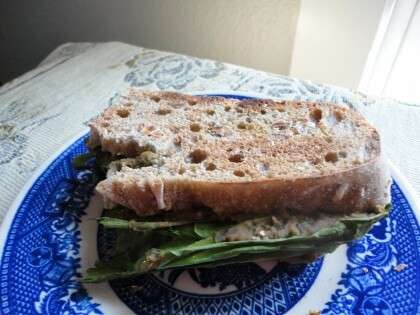 Yum….your version of the white bean & basil spread looks wonderful. I especially love it’s simplicity & versatility. Glad to hear that the spelt sourdough is allowing you to return to your beloved baking of bread & pizza dough. Thank you for sharing! Hi Debra, glad you find the white bean and basil spread appealing! 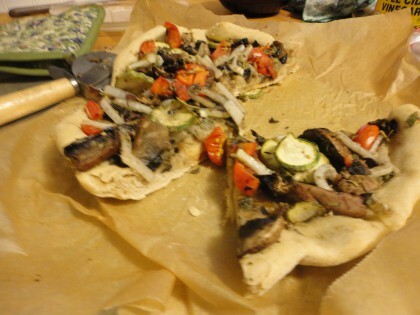 I’m happy, too, you enjoyed the story of my return to bread and pizza baking thanks to spelt. I feel very fortunate about that. Thanks for your kind well wishes! Maria, What a fascinating way you have developed for testing what works for your diet! I have to admit, that bread looks tempting. When I first started McD-ing, I was eating a puffed kamut cereal for breakfast pretty much daily, and I still was improving. I like to stay on the safe side of things, too, so I have not tried any wheat out, but you’ve ot me thinking down the line of a sourdough bread…. I, also, love baking bread, so I completely understand your missing it! It’s a tactile, sensual, fragrant, timeless and creative exercise. As I had no family tradition about baking or cooking, I learned how to bake in my early twenties from the classic Laurel’s Kitchen Bread Book. Every time I open my copy it brings back memories! And it’s got all those little stains and smudges of flour that tell me which recipes are my favorites. I haven’t made bread in the past several months as we’ve been in hot weather (and who on earth wants to have the oven on when it’s 100 degrees out!?!? But supermarket – or even bakery – bread is just not the same! So I’m so happy for you that you have made your lovely loaf. It’s beautiful and must have given you so much satisfaction. And that pizza! Looks delicious. I’ve been using exclusively stainless steel, cast iron and heatproof glass for cooking for years. I hope you will consider the same. Thanks for the suggestion, Jaye. It’s a temporary “fix”–I am looking for something else. In the meantime, my pan is not coated with teflon, per se, but whatever Calphalon uses. They say it’s safe in the oven up to 500 degrees. Nutrition information for white bean basil? Welcome, Janet. I am sorry I can’t help you with that. Not equipped to give you the nutritional breakdown on any of my recipes. And no plans to do that, at least at this point. We had this on sandwiches today and it was really good! Just a curiosity question. Have you tried making or experimented with fermented vegetables and drinks? I had a little experiment with fermented veg once and as I wasn’t sure what they were supposed to taste like and they developed a sort of “mould” like substance on the top (I have read that that is supposed to be okay) so I fed them to my worm farm! The worms didn’t complain. “Laurel’s Kitchen” was my first vegetarian book and I learned so much from her. I love it and still have it.